Corporates all over the world have introduced various forms of employee wellness programs for the overall health and well-being of their employees. Notwithstanding the technological progress and advances in healthcare, it has been a common understanding and experience that over decades there has been a degradation in the overall wellbeing of employees with increased stress, ill health, lack of happiness and peace world over. Organizations have realized that happy and successful employees alone contribute to the growth of the organization. The secret sauce for this does not lie just in the employees’ job-related knowledge and experience and in-fact lies in their well-being. Corporates all over the world have introduced various forms of employee wellness programs for the overall health and well-being of their employees. In addition to health awareness programs, soft skills programs are also introduced with the purpose of self-development and interpersonal skill development. In fact, offering such help to the organizations has become an industry by itself and many companies and individuals render valuable services in this area. In addition, there are at least a couple of hundred thousand self-development books available in the market and many more are being written. We have known for centuries that the root cause of most problems lies in our minds, the storehouse of our thoughts. The simpler and positive our thoughts are, the more effective we are. Thus, the solution to overall well-being lies in regulating our mind and restoring simplicity by removing all the complexities we have been habitually accumulating subconsciously. This is best achieved within a shorter time with long-lasting effect through meditation. Meditation removes the effect of the wandering nature of mind, often called monkey mind, by regulating it. This brings focus and attention to the task at hand. Without such a focus, our work takes longer to complete and the results are often less than desired. It is easier to understand this when we think of our mind as the software that runs the computer called our brain. We can very well imagine how unpredictable the results of a software program would be if the program keeps jumping from thought to thought, moving away from the problem it is solving. Therefore, a simple act of daily meditation regulates our mind and makes it clutter less, which benefits us both at work and home. It has been proven that meditation has many health benefits. A healthy mind with simple and positive thoughts contributes to the physical health of a person. Meditation has a profound calming effect on us and lets us go deeper within ourselves producing a stillness. Many participants have expressed that they felt calmer, lighter, relaxed, peaceful, and were able to concentrate better at work and were less agitated while driving. Some have experienced that in addition to them, their surroundings felt peaceful too. A few have reported that their friends and family members notice the positive changes in them due to meditation. Very few have wondered whether such a calmness or stilled mind makes them inactive and not perform well at work. This is because busyness is often mistaken to be synonymous to performance or productivity. As the saying goes, “Still waters run deep”. It is indeed the still mind that runs deeper. With such depth and a calmer state of mind, work often is performed better and faster. It is a common experience that solution to complex problems and innovative ideas occur when the mind is still. The emotional residue of our thoughts has been and is being accumulated as impressions within our sub-conscious, of which we are mostly unaware. These impressions are the filters through which we see the world and react. Thus, we replay our past and in-effect we are living in the past. It is possible to live in the present without being influenced by the impressions or complexities arising out of impressions, only by removing the past impressions. 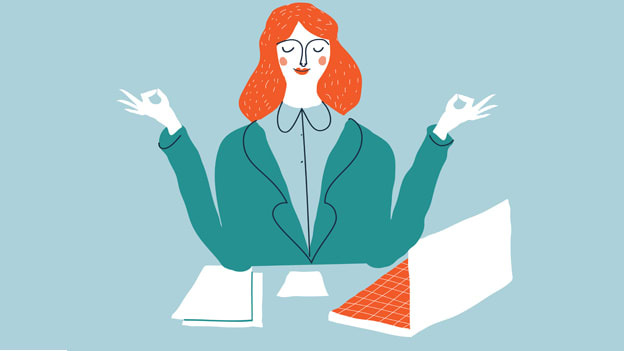 Many organizations have embraced these simple intrapersonal development tools of meditation, rejuvenation and continuous improvement to the benefit of their employees and many more will adopt in due course of time. The calmer minds contribute to a peaceful work environment greatly improving happiness, productivity and fostering innovation! NEXT STORY: When in clannish countries, do as clans do!